No. 13, Jalan SBC 2, Taman Sri Batu Caves, 68100 Batu Caves, Selangor, Malaysia. 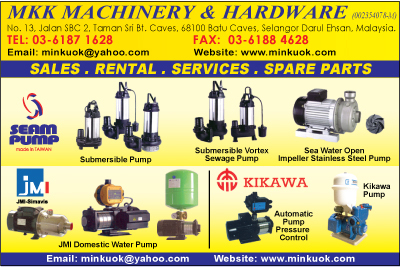 KK Machinery & Hardware supplies a wide range of machinery and equipment for submersible pumps, Bosch power tools, welding machinery, generators air compressors, tool kit, floor polisher, floor jack, snow tank, concrete mixer part, washer waste oil drain.